In a large saucepan, stir together the sugar, water and cherries. Bring to a low boil and cook for 15 to 20 minutes. The cherries will begin to soften and the liquid will thicken slightly. 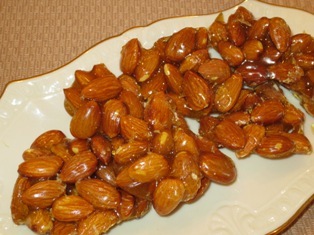 Stir in the almond extract and remove from the heat. 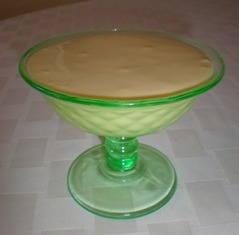 Allow the mixture to cool to room temperature before serving. The sauce may be stored in a covered container in the refrigerator for several days. 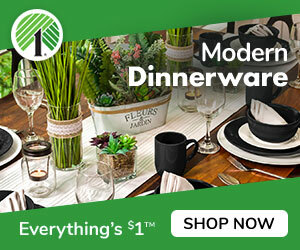 Pack cherry sauce in decorative jars and give as a gift with a homemade cake or gelato. Italy's Piedmont region is famous for its hazelnuts. The hazel tree thrives in the Piedmont soil and its fruit the hazel nut (also known as the cobnut or filbert) is an important part of its cuisine and economy. Fresh hazelnuts are harvested in August and September. The nut falls out of the husk when ripe, about 7-8 months after pollination. The kernel of the seed is edible and used raw or roasted, or ground into a paste. The small round nuts have a very sweet flavor and a milky texture when fresh. Hazelnuts are used in the nougat candy known as torrone and in gianduja, also known as Nutella, a mixture of hazelnuts and chocolate. 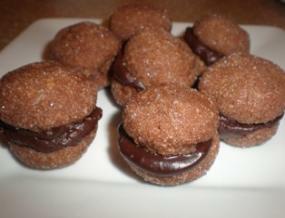 The chocolate candy known as 'baci' from Perugia contain a whole hazelnut in the center. Hazelnuts are also used to make the Italian liqueur known as Frangelico. 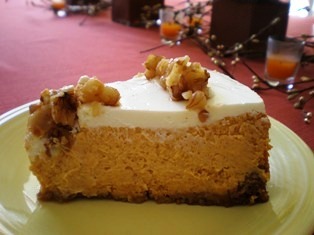 Pumpkin cheesecake combines the velvety, smooth texture of cheesecake flavored with spices on a gingersnap crust. 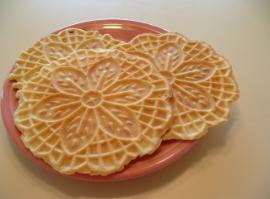 A pizzelle is a traditional Italian waffle cookie made in a pizzelle baker that stamps a design on both sides of the cookie. 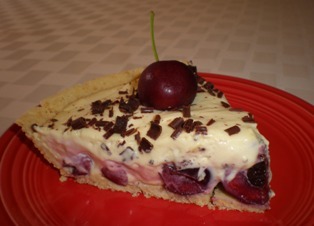 A luscious tart made with fresh cherries in a cookie crust filled with zabaglione and topped with grated chocolate. 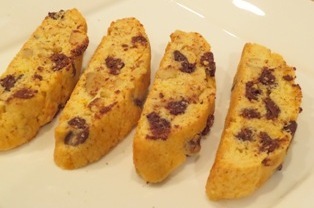 Biscotti are crisp Italian cookies that are ideal for dipping in coffee, tea, hot chocolate, or wine. 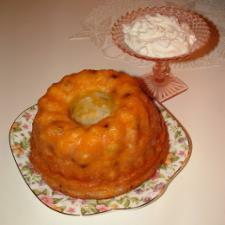 A rum baba is a yeast cake saturated in liquor, usually rum and filled with some type of dried fruit; it is sometimes served with whipped cream. 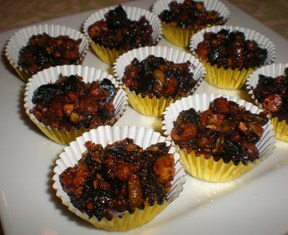 Popular throughout Italy, especially in the south and Sicily, croccante (literally, crunchy) is a mixture of caramelized sugar and almonds. 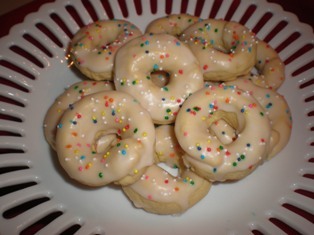 Sweet taralli are very simple cookies with a lemon glaze and topped with colored candy sprinkles. 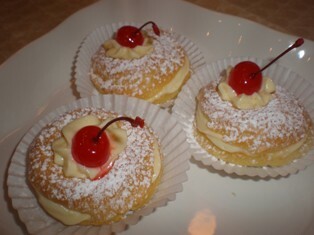 A highlight of the meal on St. Joseph's Day are the special sweets that are prepared. 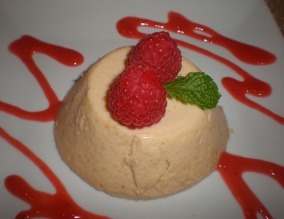 Zabaglione is an Italian dessert made from whipped egg yolks, Marsala wine, and sugar. 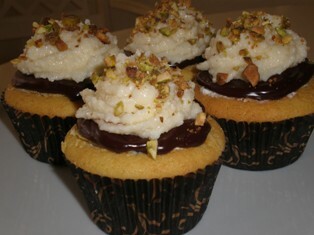 Cannoli cupcakes combine the flavors found in traditional cannolis into luscious cupcakes. 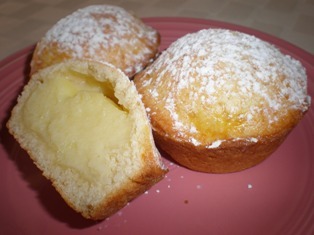 Pasta Ciotti are small Italian custard-filled dessert tarts. 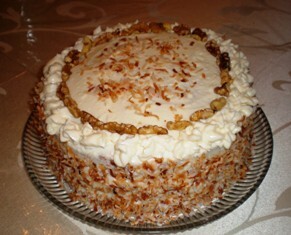 Also sometimes called Italian Wedding Cake, it is a beautiful 3-layer cake to serve for any special occasion. 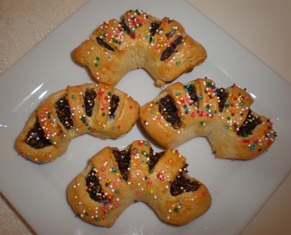 Cuccidati is a Sicilian cookie that has a sweet pastry dough wrapped around a filling of dried figs, raisins, walnuts, and chocolate. 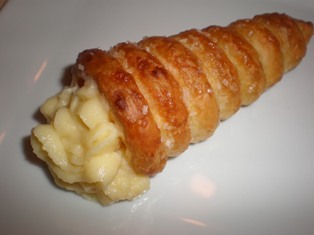 Cornetti de Crema are pastries made with puff pastry dough wrapped around metal molds, baked and filled with cream. 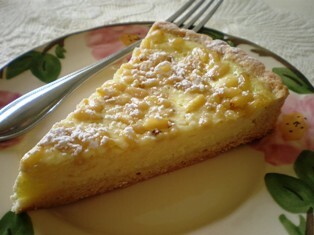 This charmingly named 'Grandma's cake' has as many recipe variations as there are Italian grandmas. Pignoli or pine nut cookies are the crown jewel of traditional Italian cookies. This recipe makes a candy with the same flavors that are found in the traditional panforte cake from Siena. 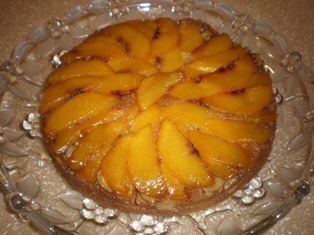 This cake is similar to a pineapple up-side-down cake but it is made with fresh peaches. 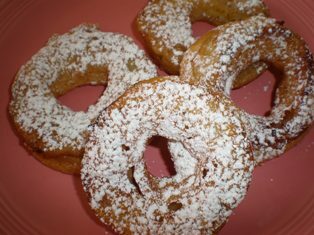 Apple fritters are made from rings of fresh apples that are dipped in batter and fried. 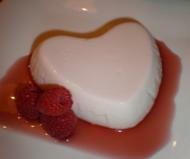 A collection of special desserts to complete your Valentine's Day menu; also nice for anniversaries, bridal showers or romantic dinners. 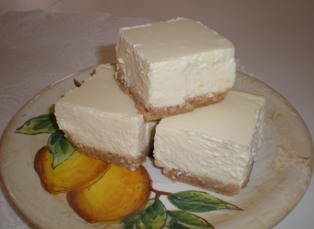 A luscious creamy cheesecake flavored with the popular Italian liqueur, Limoncello. This is a nice cake for people who don't like very sweet desserts. 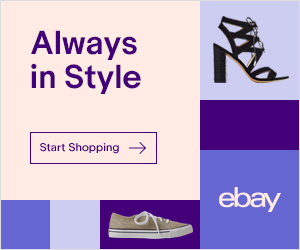 The flavor is reminiscent of a fresh jelly doughnut. 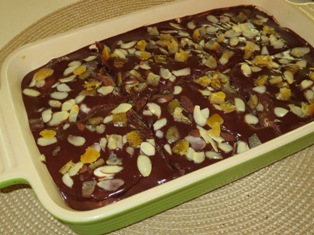 In this dessert, layers of fried eggplant are spread with sweetened ricotta and chocolate, which are then refrigerated and served cold. The polenta adds a pleasing crunch to these shortcakes topped with the juicy strawberries and spirited, lemony whipped cream. Mini cannoli cups have all the flavor of traditional Italian cannoli in baked cannoli pastry shells with the same delicious ricotta cream filling. 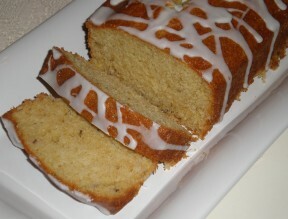 Lavender cake is similar to a pound cake with a very delicate flavor of lavender. 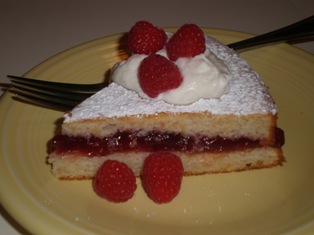 Makes a wonderful sping or summer brunch cake or to serve at an afternoon tea. This zeppole recipe combines the flavors and ingredients of a traditional cannoli, (orange, Marsala, chopped pistachios and miniature chocolate chips) in a fried dough treat. These bite-size,chocolate filled sandwich cookies are a favorite in Verona, the setting for Shakespeare's Romeo and Juliet. 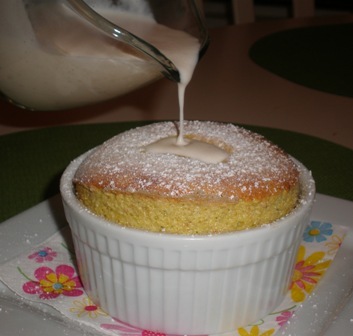 A delicious dessert souffle flavored with pistachios and a vanilla bean and topped with a luscious creme anglaise (vanilla sauce).